1) Anything worth having is worth waiting for. Cultivating locs is the ultimate exercise in patience. We are an instant gratification society and are used to instant results. If we want different hair, we go out and buy it or pay someone to change it. Growing locs, however, forces you to abandon this need for instant gratification and instead wait for what you want. Even the most intricate microbraids don't even come close to comparing to how long it takes to grow locs. 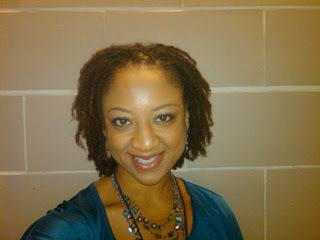 It takes at least a year for locs to resemble their final form, and even beyond that they are still changing maturing. Until that time they can be difficult to deal with, fuzzy, unruly, and some days just look downright bad. Though I have my days where I say "Man I can't wait for these locs to mature!" I have learned to not worry about them and instead focus on other areas of my life that matter, and let nature take care of itself. You cannot have locs without being willing and able to wait and endure these frustrations. I've seen the end result of such patience in my first set of locs, so with this set I have learned to enjoy each stage and celebrate the progress in my journey. 2) Too much of a good thing is not a good thing. When growing locs, less is more. There are a lot of products out there that claim to help grow locs, but most of them are unnecessary. There are a few products that do work well with locs (and which product works best is an individual thing), but even with these products too much of them causes more problems. I already confessed to my former product junkie status and how that almost ruined my locs, but that lesson really stressed to me the importance of moderation and temperance when dealing with good things, not just the bad. It is important to be able to realized when enough is enough. 3) Time heals all wounds. After I had my product junkie incident, I was devastated. I thought I had completely ruined my locs and that I would have to cut them off. They looked REALLY bad and I was just heartbroken whenever I would see other people's smooth, cylindrical locs. But I didn't give up, and eventually the locs began to heal themselves. There was nothing I could do in the meantime aside from trying to smooth out the lumps gradually each time I twisted, but ultimately it was just time that made them better. No matter how bleak, difficult or hurtful a situation may seem, with patience and caring time heals everything. 4) The only person's opinion who matters is your own. When you make the decision to grow locs, there will be no shortage of naysayers trying to tell you that you are making a mistake. People will tell you that you're never going to be able to find a job, or that locs will make people look at you negatively, or you won't be able to find a man. They will look at your unruly baby and teenage locs and think your hair looks bad. Or (like my last stylist) will try to convince you that your loose natural is pretty and you shouldn't mess it up with locs. My kids had it even worse with the outright teasing, name calling and ridicule from other children in school; most adults have enough sense not to do that, but the sentiments are still the same. However, if you know that you have a goal and vision for yourself and know that one day it will all pay off, everyone else's opinions and criticisms don't matter. I will never forget my son singing "Back then they didn't want me/Now I'm loc'd they all on me." Your critics will later be the same people singing your praises and wishing they had the tenacity and patience to do it as well. It is said, and I believe, locs conduct and hold energy, both positive and negative, from outside and from within. Without fail, when I am feeling bad, my locs are unruly and uncooperative. When I'm feeling great, they look amazing. Over time, negativity can accumulate in your locs. I know there are countless stories of people cutting their locs after going through a particularly difficult life experience, or when they are moving on to a different stage in life for this precise reason. In the past 3 years I went through an extremely trying period in my life, including divorce, unemployment, and just losing myself and my way in general. I knew, but didn't want to believe, the "loc folklore" that they hold negativity, and instead tried to hold onto them and work past it. But no matter what I did, they just looked terrible. I was using the same styling products and methods, but they just weren't responding. Finally I came to the realization that it was just time for them to go. Of course I was scared, because my locs were ME. That's how everyone knew me, the tall yellow lawyer with locs. But I knew that particular era of me was over, and in order to move on I had to let go. We can't hold on to the past and expect to be able to move forward. Some things in life are to be enjoyed for awhile, but then we have to let go and make room for new experiences. Great post! I've been thinking about getting locs, but i'm not sure i'll ever do it. Maybe one day. Onyx Rose: It definitely has to be something you're mentally prepared to do. I had natural hair 4 years before deciding to loc, and I thought long and hard about it. Definitely not something you can do on a whim or get talked into. It is 100% your own decision. What great lessons! I'm in love with locs and can't wait to start my own. So glad I have people like you to watch and learn from! Thanks for sharing! Great post! I am abt 5 months in and your words are so insightful! !